I’ve felt out of sync since the World Series ended, like a hitter swinging late at a fastball. Now that my pulse has finally slowed from a month of heart attack-inducing playoff games, I’m not sure what to do with myself or how to think about my team anymore. The words “long suffering” and “Giants fans” went together like bat and ball since before I was born. San Francisco’s shocking and unprecedented championship has forced Giants fans everywhere to reflect and reassess our place in the universe. I used to think I followed the Giants because I attended college in San Francisco or because I liked the National League style of play. But recently I realized it all started because of Danny. It’s a good thing I didn’t see that sooner, because over the years I might have been tempted to smack him with a baseball bat, like Juan Marichal clubbing John Roseboro. When I was growing up in Castro Valley, Danny was the coolest kid on our block. He had the best video games, a TV that pulled in dirty movies and more baseball cards than anyone else I knew. He was also a huge Giants fan. We lived closer to the Oakland A’s. Some kids rooted for the more successful Cardinals, Yankees and Dodgers. But to fit in with Danny and the gang, I latched onto the Giants. I was only 11 but there was no going back. Baseball is designed to break your heart, said Commissioner Bart Giamatti. That proved especially true for Giants fans. Long before broadcaster Duane Kuiper accused the team of “torture,” San Francisco committed psychological warfare against its own supporters. Everyone who has followed the team for any length of time bears the scars. Mine include the Giants’ trades of my favorite players, Jack Clark and Matt Williams, San Francisco’s agonizing near-miss despite 103 wins in 1993, and above all, the excruciating collapse in the 2002 World Series. But I kept coming back, attending hundreds of games and enjoying thousands more over the airwaves. The Giants became my companions through radio broadcasts on evening runs in the park and summer backpacking treks through the mountains. I had great fun assembling an all-time team of my favorite players like Jim Barr, Bob Brenly, Robby Thompson, Greg Minton and Rod Beck, each of whom autographed a baseball card for me. I even got lucky enough to find a publisher which paid me to write two books about my favorite team. Interviewing Felipe Alou, Mike Krukow, Will Clark, Darren Lewis and Dusty Baker was a privilege. Every win brought joy. Every loss became a forbidden subject. Somehow San Francisco often combined the good with the bad. The Giants opened a beautiful waterfront ballpark park in 2000, only to lose their first six games there. Barry Bonds broke home run records while becoming a poster boy for the steroid era. And no matter what else happened, the team’s championship drought dating back to 1954 always hung overhead like frigid San Francisco fog. I got used to the fact that no matter who wore the uniforms or how well they played, sooner or later the team would always crash and burn. 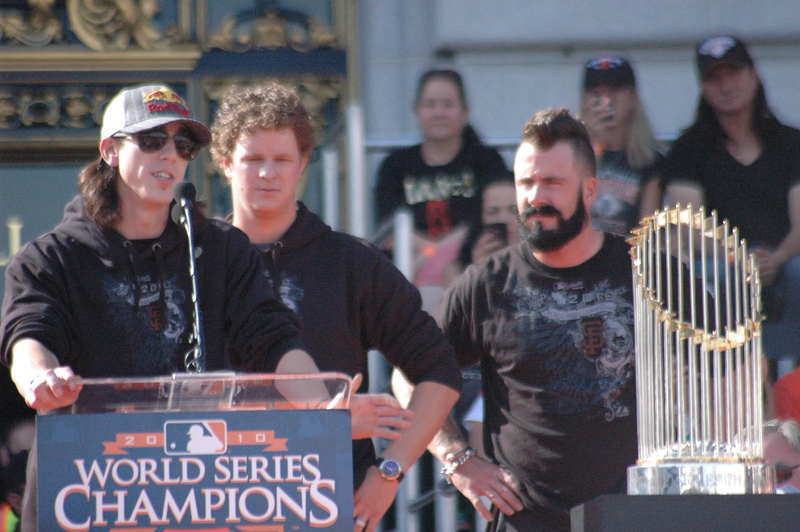 Tim Lincecum, Matt Cain and Brian Wilson show off the prettiest trophy in sports. Naturally the 2010 Giants’ improbable World Series win thrilled me and millions of other fans who never thought they’d live to see our team win it all. I’m even more exhilarated at how they did it. San Francisco won with an incredible combination of lights-out pitchers like Tim Lincecum, Matt Cain and Brian Wilson, hard-working veterans like Aubrey Huff, surprising breakthroughs like Andres Torres, castoffs like Cody Ross and up-and-coming kids like Buster Posey. Unlike other championship teams from the last decade, there’s not a drug cheat or a prima donna in sight. These Giants are among the most likeable and unlikely teams to ever win the Fall Classic. We may never see their like again. 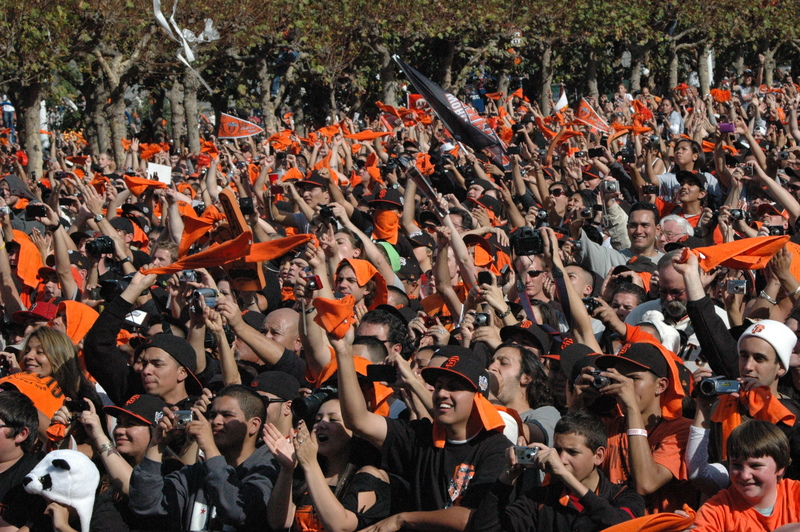 It’s tempting to say that the 2010 World Series made my years following San Francisco worthwhile. It certainly sweetened the deal. 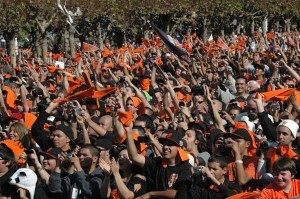 But truthfully, it was all worth it even before the Giants’ parade down Market Street. I’ve been fortunate to meet players like Robb Nen, Kirk Rueter, J.T. Snow, Juan Uribe and Edgar Renteria. I got to see the team play in cities across the country. When I traveled abroad, tuning in from overseas made me feel close to home. The game brought me closer to friends who share my passion for the national pastime, especially those who cheer for the orange and black. Baseball has helped tie together my family through trips to spring training, dozens of ballpark outings and countless conversations around the dinner table. My wife and I attended a game on one of our first dates. My dad and I saw the last game at Candlestick, the first at 24 Willie Mays Plaza and the Giants’ clincher this year against the Padres. I had golden memories even before San Francisco won its first golden trophy. After we finished high school, I didn’t see Danny for 20 years. But then we reconnected at a Giants game and now I see him at the ballpark all the time. So when I run into him next season, I’m going to buy him an overpriced beer and thank him for helping me make a lifetime friend. Toasting the world champions will feel quite different than drowning our sorrows, but I think Giants fans will get used to it. After all, change is part of the game.